Jacquesson & Fils, a small and excellent Champagne House, is located in Dizy in the Marne valley near Epernay, and their Champagne was reportedly a favorite of Napoleon (if true, Napoleon had good taste!). They are more grower producer in attitude than a standard producer. They claim to be the oldest independent Champagne house, founded in 1789. In 1869 they supposedly produced a million bottles a year, but now make about 350,000 yearly. 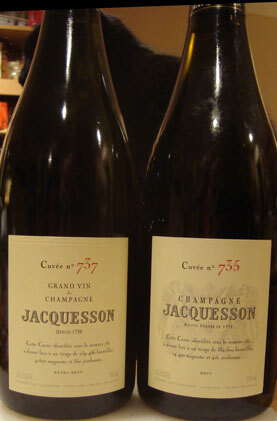 The Chiquet family purchased Jacquesson in 1974. Jacquesson owns most of their vineyards, about 85%, with Grand Cru vineyards in Aÿ, Avize and Oiry and Premier Crus vineyards in Dizy, Hautvillers and Mareuil-sur-Aÿ. They also buy about 15% of their grapes from the above mentioned areas as well as from Chouilly (Grand Cru) and Cumières (Premier Cru). They plow between the vines, encourage grass to grow, use little or no soil improvers, no herbicides or pesticides, allow malolactic fermentation, and short pruning - traditional methods. Each plot of vines is vinified separately. Jacquesson is unique with their emphasis on their Non Vintage NV, their "700 Series," and their attempt to make it as great as possible including allowing vintage variations. Most producers and all major producers blend their NV for uniformity each year instead. Since they have stopped making their standard vintage wine as of 2002, their NV 700 series is their only blended wine and presumably they can focus even more making it awesome. The 700 series - these are Non Vintage wines, but their is no attempt to hide the vintage characteristic of the main vintage although it is blended with reserve wines. These are numbered to distinguish them, as for example the Cuvee 734, 735, and 737 described below. About 1/3 each Chardonnay, Pinot Noir, and Pinot Meunier). The Lieux-Dits - in exceptional years, they bottle some of their exception terroirs separately. These obviously are made in small numbers as the vineyards are quite small. They are: Dizy -Corne Bautray (1 hectare Chardonnay planted in 1960), Avize Champ-Cain (1.3 hectares of Chardonnay planted in 1962), Ay, Vauzelle Terme (0.30 hectare of Pinot Noir planted in 1980), and Dizzy - Terres Rouges (1.35 hectares of Pinot Noir planted in 1993). Avize Grand Cru - A Grand Cru vintage wine which all Chardonnay grapes from Avize, with vines planted from1962 to 1983, and vinified in oak casks. Millesime - their standard vintage wine, made from Chardonnay and Pinot Noir, fermented in oak casks. 2002 is the final vintage, and the only blended wine they now produce is the 700 series. Degorgements Tardifs - late release wines which spend extended time on the lees aging. They include their Avize Grand Cru and Millesime. Tasting Note: Jacquesson Cuvee 737 Non Vintage, rated A- and did not disappoint. Nov 2014. Based on the 2009 vintage (70%) plus reserve wines. 43% Chardonnay, 17% Pinot Noir, 30% Pinot Meunier. Dec 2013 disgorgement, dosage: 3.5 gr/l. Unfiltered. Nose: Aristocratic and creamy with slight apple tones, chalk, other minerals in the backdrop and lime with air. On the palate it starts with a funky (in a good way) rich apple and good acidity. It opens quickly to be creamy, very smooth, aristocratic, with a bit of lemon and orange peel. Some honeydew melon with air. The funkiness may have come from a slightly off bottle of Cuvee 735 that was opened simultaneously? Tasting Note: Jacquesson Cuvee 735 Non Vintage, B+ Dec 2014. Nice but distinctly a step down from the 737! Based on the 2007 vintage (72%) plus reserve wines. 47% Chardonnay, 33% Pinot Noir, 20% Pinot Meunier. Feb 2012 disgorgement, dosage: 3.5 gr/l. Unfiltered. The first bottle was opened together with the 737 above, and despite being slightly off, was some people's favorite of the two. Many thought the bottle was fine, but it was off to my palate although certainly pleasant and drinkable. These notes are from the second bottle. The nose has delicate orange blossoms, wet chalk, apple peel, golden apple with air. Lots of lovely rolling minerals after approximately an hour. Palate - Freshly cut apple, apple juice, some citrus tones. Nice body and persistence. Tastes quite sweet despite low dosage. 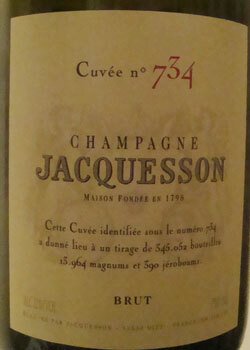 Tasting Note: Jacquesson Cuvee 734 Non Vintage, rated A- and absolutely lovely! Quite light in color, a pale yellow, with very fine bubbles. Nose : Apple, chalk, minerals, lemon-lime. Exotic tropical fruits on the edges of the tongue. Grapefruit, uglyfruit, and tangerine among others. The persistent orange and apple in the finish as it opens up is wonderful and warming. It also has some citrus peel and plenty of minerals. Absolutely wonderful and elegant. This will only improve despite being a NV.